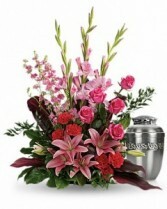 A Beautiful Flower Wreath that can sit around the Cremation Urn. 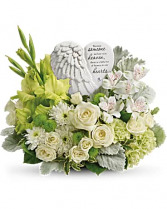 Share your heart and show your love with this magnificent display of green and white blooms, gracefully surrounding an angel's wing keepsake with a loving message of sympathy. Message on sculpt reads: "Because someone we love is in heaven, there is a little bit of heaven in our hearts." White spray roses, white alstroemeria, green gladioli, green carnations, green button spray chrysanthemums, and white cushion spray chrysanthemums are accented with dusty miller, pitta negra, and lemon leaf. 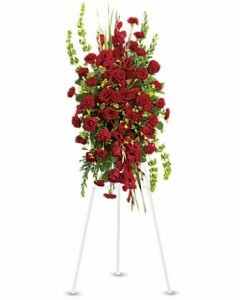 Delivered with Teleflora's Heaven's Heart keepsake.